I’ve dabbled in canning here and there periodically over the years, but last summer I was bitten by the canning bug, badly. The inspiration was probably due in part to my ever-increasing infatuation with local food, as much as it was to harvesting my first real crop of homegrown veggies. I had an abundance of hot chili peppers, something Chris is particularly obsessed about, and we already had a stockpile of them dried so I made salsa, hot sauce, pickled peppers – you name it, as well as chutneys, relishes, pickles, jelly and jam. This year my buddy Alice has been bitten by the canning bug, but she has less experience than I do, so we decided to have a salsa night and we went crazy! I decided after last year’s canning insanity, the product of which I haven’t even begun to make a dent in eating, to just make salsa this year, since its the one thing I am eating constantly. I’ve never been able to get enough salsa, and ever since I discovered Rick Bayless, I don’t even consider buying the stuff anymore. 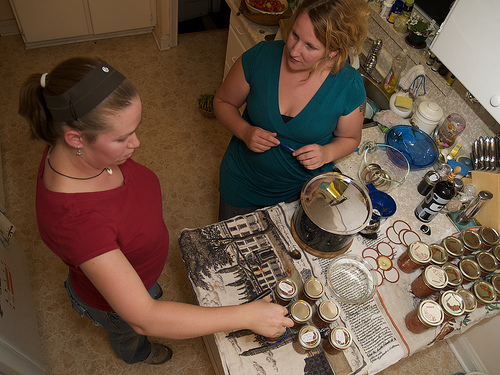 Alice (right) and I making salsa. Photo: Chris (he likes to play with funky angles). We got a whole wack of tomatoes, including many from my garden as well as locally grown field tomatoes, garlic, sweet peppers, onions and roasted banana and jalapeno peppers from my garden. 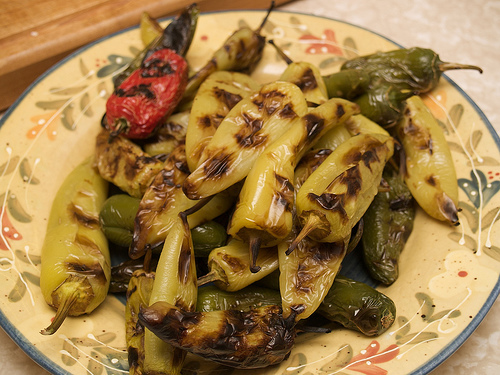 I like to roast them to help soften the heat a little and add more flavour. 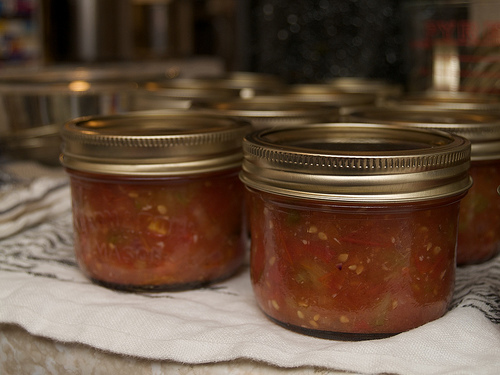 We chopped everything up and divided everything into two batches to make cooking and canning them more manageable. Lime juice and a bit of apple cider vinegar, and a tablespoon of salt rounds out the ingredients. 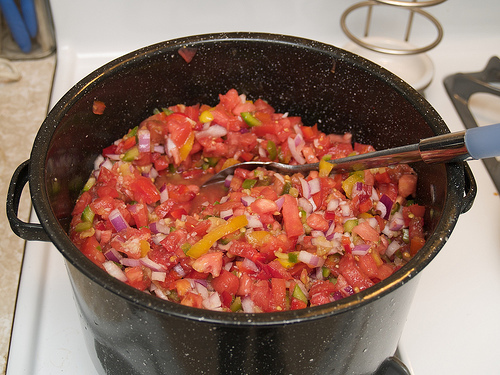 The salsa itself only needs to be cooked at a boil for about five minutes before being poured into sterilized jars. We added cilantro at the last moment for extra kick. I wash all jars, including brand new ones out of the box, in the dishwasher before I use them. Then I pop them into a big stock pot with a rack in the bottom to sterilize. A good ten minutes or so usually does the trick. Then you use a special set of tongs to pull them out of the water right before filling them. The trick is to keep everything hot and to work fast – much easier when you have two people! 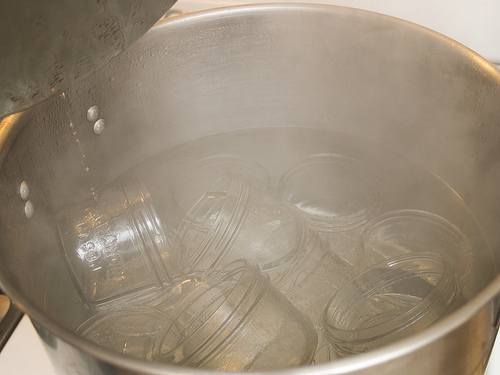 Hot lids are placed on clean jar rims and then the rings are placed on, only lightly tightened, because next you process the filled jars under boiling water for about 15 minutes (for a 250 ml jar). Then you carefully pull out your hot jars, set them on the counter to cool and listen for your lids to pop (a sound that made Alice giggle with joy!). Any jars that don’t seal down nice and tight (this can sometimes take a while with larger jars especially) should be either stored in the fridge and eaten soon, or frozen, because they haven’t sealed tight enough to store on a shelf. Otherwise, well-sealed jars can be stored in a cool dark place. We ended up with about 14 litres of salsa total. Kinda nutty, but we split that up between us and now we’re both stocked. AND it makes a great gift!